We know good when we see it. We know it when we see good. But sometimes we hesitate when an opportunity comes along to do good. That’s because too often we listen to the wrong voices. The voice of impatience explains that we’re too busy to help that lady unload her grocery cart while she struggles with three kids. The voice of timidity tells us we’re too scared to get involved. The voice of justification says that it wouldn’t have made a difference anyway. After all, what’s one more piece of trash on the ground. The voice of self-doubt wonders if offering a food card to a vagrant is the right thing to do. The voice of self-interest tells us to worry about our own problems instead of trying to help someone else who may be struggling. Instead of listening to those voices, trust your gut. If you see an opportunity tomorrow to do something good, don’t hesitate. Do it. Do good. Your gut may not have a voice, but it knows what to do. Today’s gift of “time” … There was a woman on the on-ramp with a cardboard sign tonight. She held up a piece of her artwork. I handed her the Subway card and quote in the picture then told her I liked her drawing. She squealed. I heard the joy in her voice and I knew it was good. 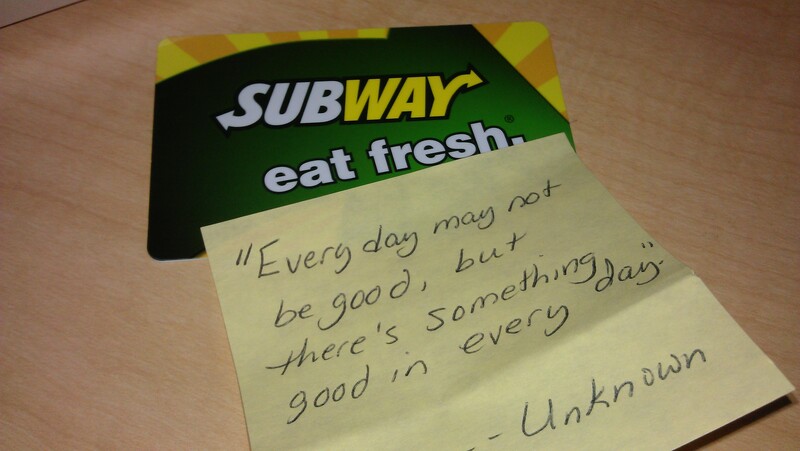 This entry was posted in In the community and tagged cardboard sign, doing good, Giving Our Time, giving time, good, Helping Out, Making A Difference, Subway, voices. Bookmark the permalink.